Don’t freak; Pat Drummond isn’t leaving the planet any time soon that we know of. However, in this the year that Pat celebrates several major milestones, a raft of talented musicians and others threw together one hell of a tribute show in Canberra to honour the man. Some milestones: 60 years on the planet, 45 years writing songs, 40 years married, 35 years in the music business, and 25 years since he was arrested for climbing the harbour bridge before it was legal. Pat, you don’t look a day over 205. The idea was simple: get Pat along and have him sat in the front row while a stack of talented performers interpreted his work. Ok, maybe not so simple. The line-up changed a little in the months preceding, and it was only as recently as the National Folk Festival in April that Celtic band Humbug stepped into one gap. While the backbone of the performers were those who know Pat’s work intimately (Fred Pilcher, Karen Lynne, Craig Dawson), that still left a lot of work with charts and dots for performers (like Humbug) who were not as familiar with Pat’s back catalogue. My mail is that Fred Pilcher was instrumental (theng ewe, theng ewe) in committing some of the more obscure songs to charts for the troupe. The coup de grace was one extra special guest. This was part of the reason that the guest of honour had to hover somewhere a ways away from the venue until about 20 minutes before show-time, waiting on a phone call before being allowed into the Canberra Southern Cross Club’s Turner Bowlo. Pat’s brother Geoff Drummond, a member of Pat’s old family band (Toot, Whistle, Plunk and Boom Band) now lives in the middle of nowhere out past Gawler in South Australia. When the concert kicked off, Geoff was secreted in a part of the club he knew Pat would never find him – in the pokies section. So, two songs in, as Fred Pilcher (also a Tooter, Whistler, Plunker and Boomer) had started Pat’s Shoalhaven Man, Geoff just magically appeared on stage and blended in to the music and harmony. The look on Pat’s face was legendary. I hope the video of Pat with mouth wide open and arms spread outwards in disbelief does more justice than my dark and grainy photo. Geoff then provided the main-stay of proceedings, along with Fred Pilcher, and Craig Dawson, the last of these later joined by Simone Dawson for a bracket. Pat’s long time musical partner Karen Lynne paid tribute to the softer side of Pat’s songs with a set that was all about the love. And then Humbug did an amazing set with glorious instrumentation, including another mainstay of the night, Rita Woolhouse on haunting cello. If anyone was under any misapprehensions that Pat would sit meekly in the front row all night just lapping up what others had to offer, well, they should get to know the guy a bit better! Pat eventually joined his old band members Geoff and Fred, and they were off. Pat felt like there were ‘gaps’, those being primarily due to his late brother, but to the rest of the crowd it was a wonderful, elongated set with a stack of encores. The consensus afterwards was that the strength of the lyrics was only equalled by the beauty of the harmonies that three old blokes produced. Doesn’t sound like anyone we saw that night. The whole night was a stunning success, and a tribute to the hard work of all involved, especially Craig Dawson and Fred Pilcher. And another of the hardest working individuals on the evening was musician Daniel McFeely who spent the whole night operating two video cameras to preserve the vision. Oh, I nearly forgot. There was a wonderful visual tribute from someone who couldn’t be there on the night. You may have heard of him: Ralph McTell. Ralph paid tribute to Pat’s skills as a musician and interpreter of people’s stories in a one-minute video shown to the crowd. The next day there was a recovery BBQ hosted by Ros Hales (Humbug, The Shed Sessions) and Mal Bennett (Humbug, Franklyn B Paverty) and after we’d all had our fill, I thought this would be an opportune time to shove a recording device under Pat’s nose, or more to the point, his mouth. Pat: To be welcomed in Canberra is a startling thing, but to have a tribute show done for you underlines the fact that you’re no longer an act. Since we’re so close to the National Museum, they’ve decided that I should be instituted as an exhibition there. There comes a time where you realise that you’re not in a ground-graping van view. Bill: That’s easy for you to say! Pat: Ground-breaking vanguard of the new music – it’s something that you’ve done has been become so antiquated that it’s tradition. That’s the strangest part of life is that all of us move from being radicals to traditions. One of the most moving things from last night was that they weren’t asked to do it; the audience just suddenly burst into the chorus of The Sao Song. It was like it had become part of their language. Geoff Drummond (from across the table): It was like going to the Rocky Horror Show at midnight. Everyone knew the moves! Pat: Yeah! Everyone knew the actions!! [As for the rest of the songs], I had no say over whether they were playing the ones I thought were the best or not. I couldn’t direct proceedings or anything! I was so disempowered, I felt like I was at home with my wife and daughters! Bill: Were there any songs that bobbed up that you thought, ‘Oh no, not that one’. Pat: Ah, yes! When I was about 14 I wrote a song called, ‘The March of the Golliwogs’ which was a rather politically incorrect piece about the, ah, erm, errrrrrrr, sexual peccadilloes of the strange creatures we call golliwogs and teddy bears, in the teddy bear shop after dark. See, a lot of those creatures just pretend that they’re inanimate objects. Because they know we’ll do all the work for them. I didn’t realise how politically incorrect that was back when I was 14, that it might have had overtones of white fear of black men. And ‘woggy woggy woggy’ didn’t actually mean ‘wog’, and predated even the point where ‘wog’ is now anthemic label that Italians and Greeks wear proudly. Bill: What did last night feel like when it was all done and dusted? Pat: When it was all done and dusted, I was just gob-smacked that people had gone to such lengths to rehearse those songs for that event. With beautiful cellos and flute arrangements. 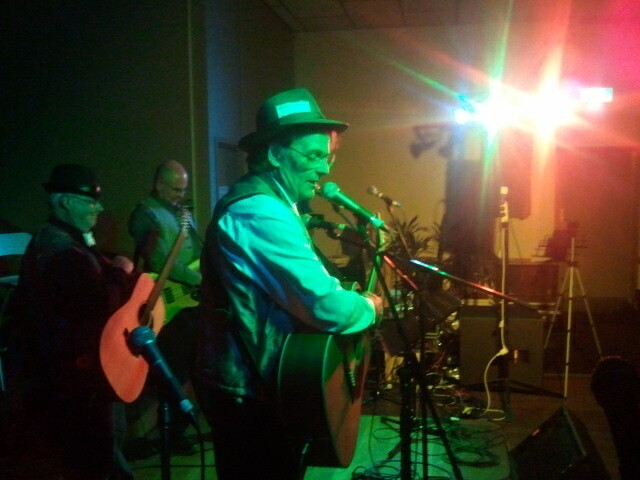 I thought I’d turn up to a tribute night and it would be a few people doing songs on guitars. It wasn’t like that. The amount of preparation that went into last night. The orchestration. And the obscure things. People veered away from the iconic Pat Drummond songs like the Road to Damascus, and moved in the more gentle and introspective songs like Calling Me, not written about political material that’s in your face, but one that was written on a mountainside that ended up as track seven on an album that came out in 1984 or something. I will mention that Pat closed proceedings by noting that everyone probably deserves their own tribute show for doing what they do: teacher, nurse, parent. So we decided that we’re going to start with the audience from the night, so I think his name is James that we’re starting with, and we’ll cover the remainder by sometime in 2019. Well played to all, and I’m looking forward to the next gig when Pat cracks 120.